Macon-Bibb’s age-friendly action plan was developed by a 28-member Community Advisory Council, which identified areas of concern and potential improvment in each of the eight domains of livability established by the World Health Organization. The heart of the Macon-Bibb action plan resides in a section called “Age-Friendly Goals and Action Items,” which runs from pages 18 to 47. Starting on page 11, the report recaps Macon-Bibb’s age-friendly efforts and events from 2012 and 2013. After the action items, the remaining pages consist of seven appendices that contain such items as the community’s orginal resolutions as well as its Active Living Workshop report from the Walkable and Livable Communities Institute, a health assessment report and an emergency action plan. Among the most useful of these added documents is “Appendix D: Evaluation Process and Age-Friendly Work Plan.” Organized in a table format with columns that clearly identify the domain, goal, measures, indicators and status dates, the plan as well as its presentation is a useful resource for like-minded communities. 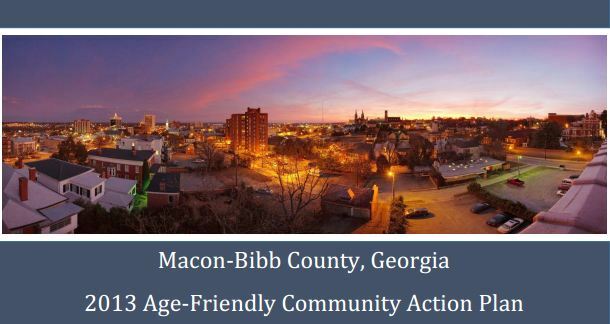 Download Macon-Bibb’s age-friendly action plan.